Craving the flavors of spinach-artichoke dip, but looking for something a little more filling? This decadent one-pot, cheesy baked pasta is topped with crusty bread crumbs and has the same flavors everyone's favorite creamy appetizer. The creamy pasta is packed with 20 ounces of spinach it cooks down a ton), time-saving canned artichokes and three types of cheese. Quickly broiling the pasta at the end adds that crispy, crave-worthy topping that everyone loves. Try using shells, orecchiette or another small pasta shape in place of the penne if you like. Baby arugula adds a peppery kick when substituted for the spinach. Enhance the flavor of the bread crumbs by adding 1-2 tablespoons of grated Parmesan cheese and chopped parsley. To make the dish vegetarian, simply use vegetable stock in place of the chicken. Per Serving: 708 calories; 37g fat; 62.1g carbohydrates; 35g protein; 98mg cholesterol; 1034mg sodium. My wife LOVES spinach-artichoke dip. This tasted just like it. You could also do this as a mac and cheese, just replace the penne with macaroni. This is the perfect dish for a college football tailgate party. I added chicken to it and it was the perfect dish. definitely delivers on those Spinach Artichoke dip flavors, always a killer combo. Next time I'll probably add more crushed red pepper for more kick, but that's easy enough to finish off each serving with. OH MY GOODNESS....this was delicious!!! 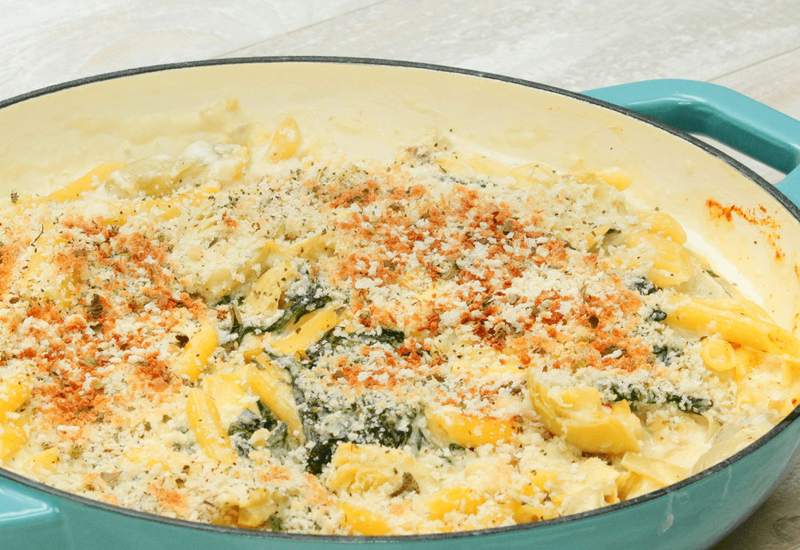 what an idea... hubby and I love spinach artichoke dip, to make it as a pasta dish!!! yummmmm...will definitely make again and again. Two of my favorite things, spinach dip and pasta! I'm on carb overload right now but that's ok because it was so delicious. I did add more cream cheese and Monterey Jack, and a little paprika too. Just some small revisions. Perfection!